A couple of weeks ago, I was on a thrifting roll. Six new-to-me items came into our home. SIX! I don’t usually have that much luck on a regular shopping trip, let alone while thrifting. That is why I will never make it as a fashion blogger. Here are the items that caused me to open my wallet and one that was garbage and I had to spray with bleach. 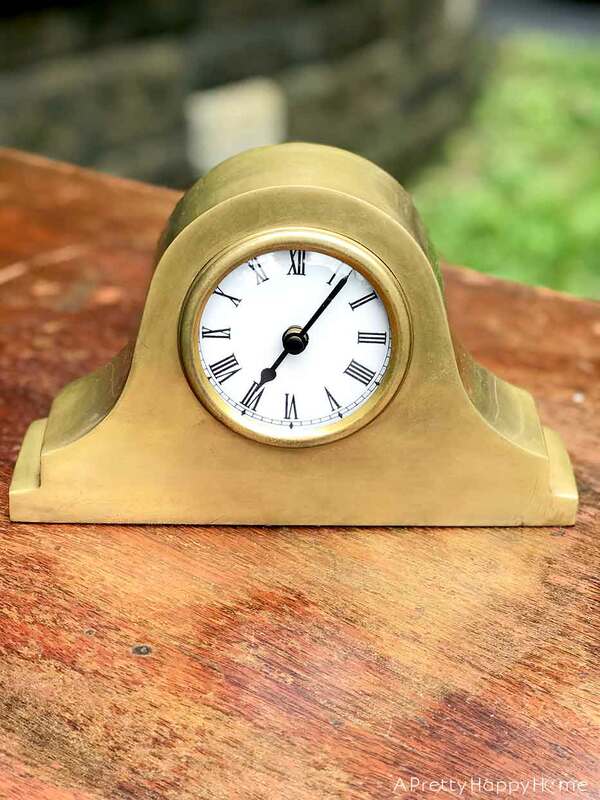 First up is this brass mantel clock made by Bombay Company. The angels started singing when I saw this beauty, but I walked away from it. I made a loop around the store and the angels were still singing, so I snatched the clock up. It’s simple with classic lines that I know will always be in style. The clock was $15 and I didn’t even know if it worked. I feel like I overpaid for it, but I feel like I overpay for everything. The checkout lady gave me 10% off my $15, so I felt moderately better. At least the discount paid for the sales tax. By the way, the clock does work. It just needed an AA battery and yes, I used one of my rechargeable ones ! I love those things. 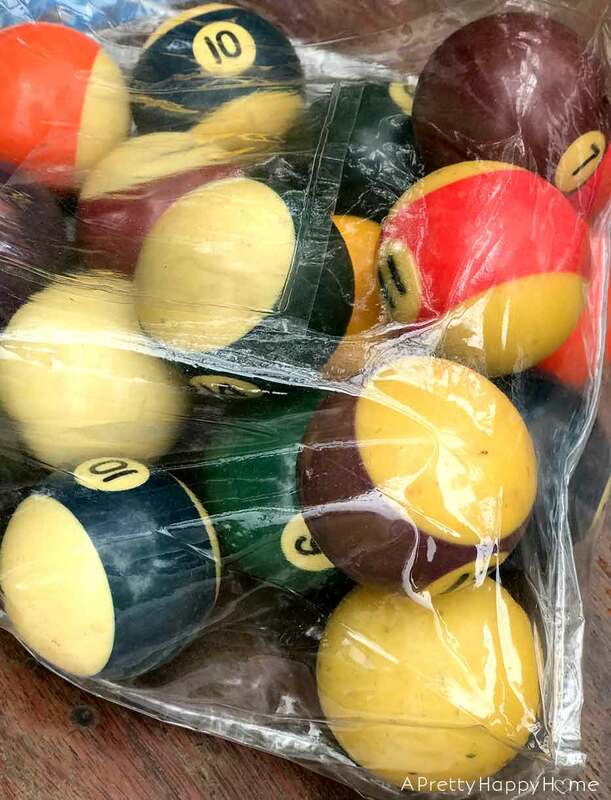 The second thing that came home with me was a bag of old pool balls. Did I need these balls? No. Of course not. I don’t have a pool table! I don’t even remember the last time I played pool. I have vague recollections of being terrible at it though. I found this bag o’ balls (try to say that with a straight face) sitting on a chair in the store’s sad recliner chair section. There was no price tag on the bag. I glanced around to see if someone might have set the bag down accidentally, but I was alone. So, basically, I sprinted away from the sad recliners with my bag o’ balls. Here’s a fun fact about me. I’ve really honed my multi-tasking skills. I can sprint away with my thrift store treasure while trying to guess how much I will be charged for said treasure. In this case, I decided I would pay $10, but I wouldn’t pay more. I have limits to being overcharged! I sweetly, but casually inquired about the price of the balls. I didn’t want the cashier to think I was super interested in them even though I was basically cradling them like a baby. This is why I don’t let my internal dialogue out very often. I don’t know what I’m going to do with these balls yet, but my first inclination was to use them to make an art piece for my son’s room. The third thrifted item that came home with me was this small side table. It was $15 and I didn’t even realize it had a drawer until I got it home. Professional, detail-oriented thrifter I am not. The table’s finish is in really rough shape. I’m going to try some Restor-A-Finish on it first before I go to the trouble of refinishing it. We needed to get our printer off the ground and this table was the right size. 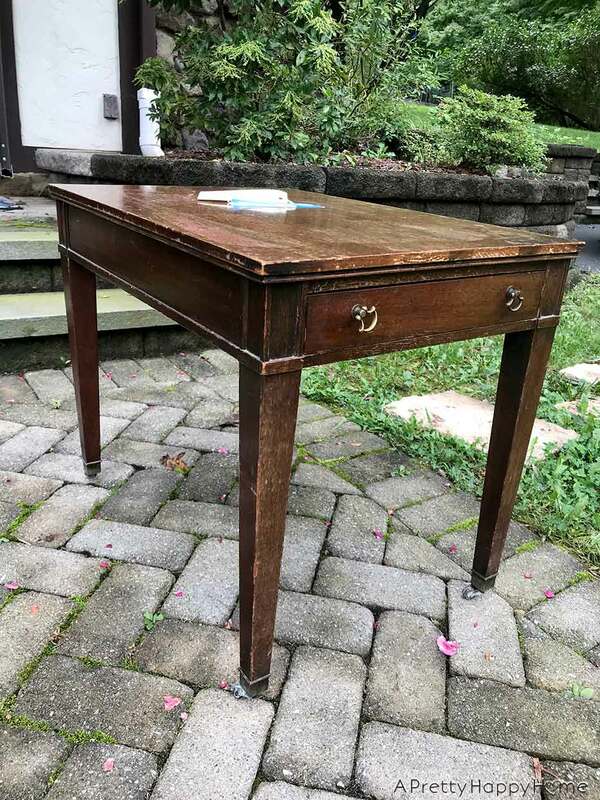 But what really sold me on the table and why I might need to move it to a more prominent spot in our home was because of the cute feet. These are the tiniest casters I’ve ever seen! They are smaller than a petal from a tree blossom. As a side note, I have a tree that bloomed in September. It is very sick or very confused. Or both. I saved the best item for last. I know you guys love it when I dig around in the garbage for things. I’m sure the mental image is hilarious. The smell is not. Technically, this find was not IN the garbage, but it was intended for the garbage and never got there. It is half of a wooden ladder! 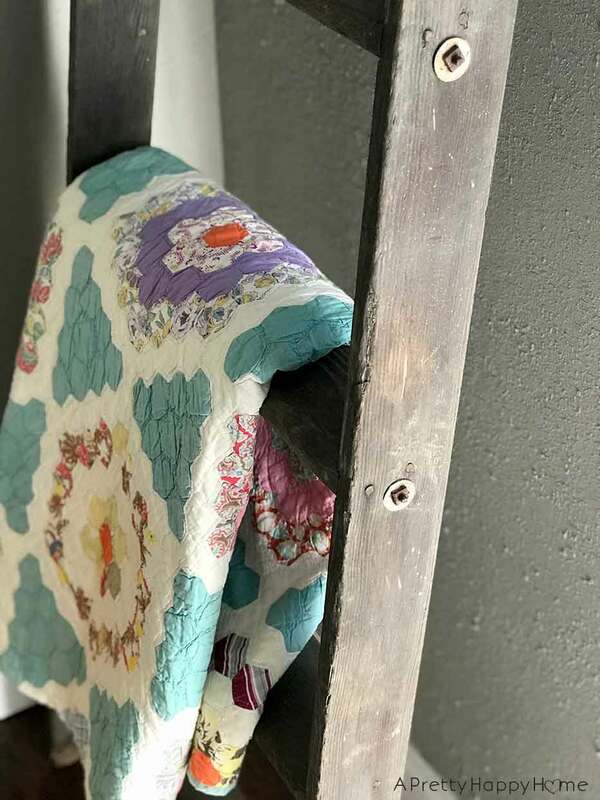 Half is all I really need to make a blanket ladder! The ladder was under one of our decks and I just noticed it – four months after we moved in. 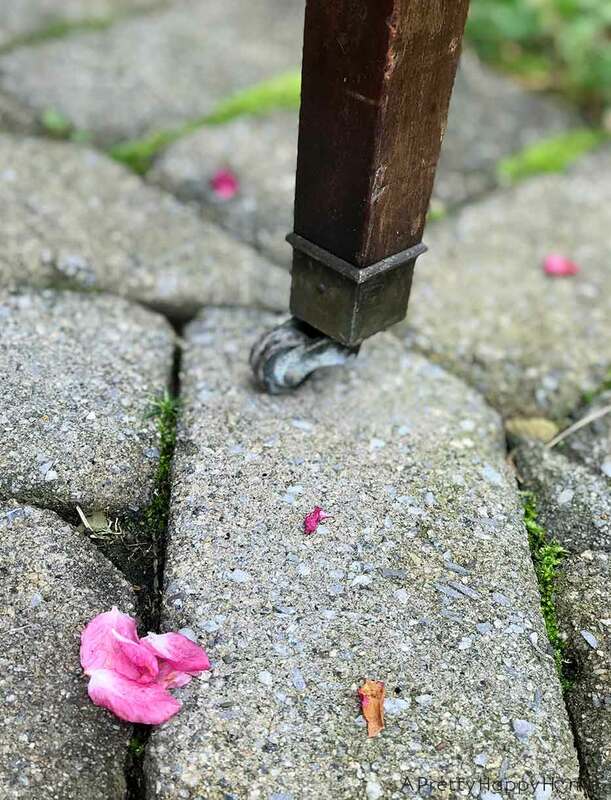 I was under the deck cleaning up items that have clearly been left there for years and realized that I had found treasure hidden in plain sight. I cleaned the 7-foot ladder up and now it’s holding blankets in my living room. The quilt in the above picture is probably 100 years old and was made by one of my relatives. Having it on display is much better than having it tucked away in a closet. Now, if you were really paying attention, I mentioned at the beginning of this post that I brought home six items. There are still two left items left to tell you about, but they deserve their own stories. A grandma, anti-psychotic drugs and army intelligence are involved. Not all at one time though. I don’t think. Regardless, it makes me happy to bring home items with a storied past. Although, I prefer to bring them home without spiders and other creepy crawlies attached. If you enjoyed this post, here are some other treasures. About that one time I dumpster dived. About that one time I took a book from the garbage to make a book pumpkin. About that one time I found garbage on the side of the road and made it into art. I love your purchases. I can’t wait to see what you do with those balls. Also am looking forward to the refinished table. I’m sure it will be beautiful. I have some ladders in my storage shed that are really unsafe to climb on. Maybe I should refinish one for my quilts. It is food for thought.